If you plan on traveling with pets, your animals’ safety is a critical consideration. Whether it’s by car, train, or plane, you’ll need a harness, carrier, or crate to secure them. The safest dog car harnesses and pet travel carriers and crates share one thing: they are CPS certified. That means that the Center for Pet Safety, in partnership with Subaru, has crash tested them (they use largely the same parameters as are used to test the safety of child car seats) and found them to be effective. In the case of a dog harness, that means the dog was restrained through multiple crash tests. 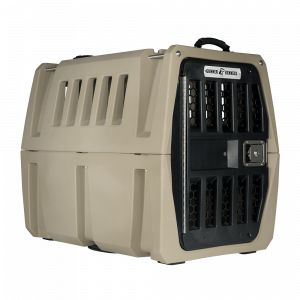 For carriers and crates, that means your pet was protected inside and was not crushed in any way. Let’s be quick to add here that live dogs were NOT used in these tests but rather crash test dog dummies of different sizes, representing (for the dog harness) a 25-pound terrier, 45-pound border collie, and 75-pound golden retriever. 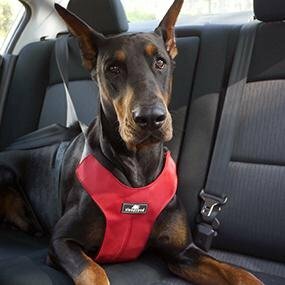 Why is it important to buy only CPS-certified harnesses? Because they are the safest dog car harnesses, carriers and crates available. If a harness gives way in a crash, your dog or a carrier can become a projectile in the car, putting the dog and passengers at risk. And in the case of carriers, if they are not built strongly enough, they can be crushed. The Center for Pet Safety was founded by Lindsey Wolko whose English cocker spaniel Maggie sustained injuries (fortunately not life threatening) after she had to slam on the brakes in traffic. 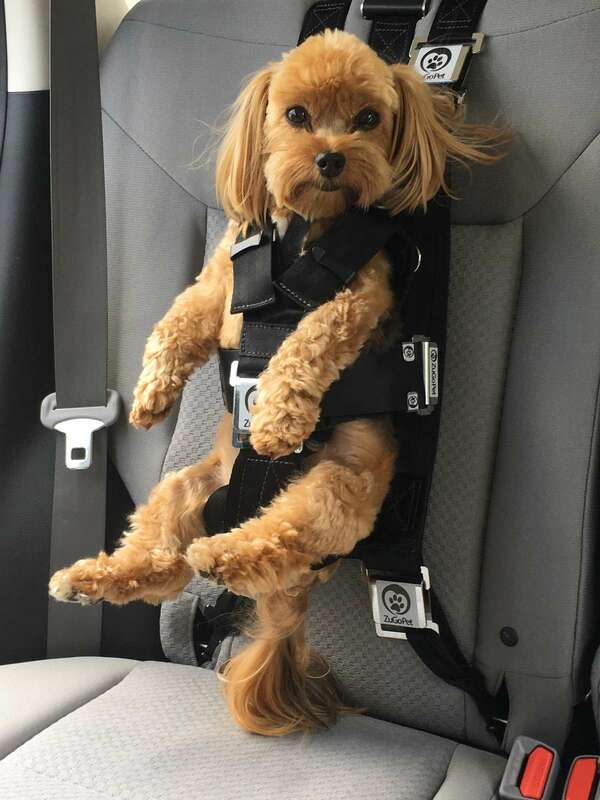 Despite the use of a dog seat belt, Maggie was thrown forward into the front seat. Lindsey has made it her work to ensure safety when traveling with pets. This harness (below) has a Y-shaped design that secures your dog’s entire torso. The harness is padded to keep it from cutting into your pooch. It can also be used as a walking harness and has light-reflective strips. The Sleepypod Sport is available in four colors and four sizes (small, medium, large, XLarge) with XLarge able to handle a dog up to 90 pounds. This harness is not suitable for greyhounds, whippets, salukis, Afghans, or borzois. This shares all the characteristics of the Sport, except that it has a broader padded harness, and it is suitable for all breeds of dogs. It is available in four colors and four sizes: small, medium, large, and Large. It also has an optional dog backpack. This quilted harness (see left) is available in five sizes (extra small, small, medium, large, and XLarge) and three colors. The largest size accommodates a dog of 25 pounds. It’s a really neat design that essentially holds your pooch like a Baby Bjorn would, only facing forward. This carrier is meant for airplane travel. It is 22″ long and 10.5 inches wide and high, and will fit a dog up to 17.5 pounds. It has a padded strap and plush bedding, and comes in six colors. The Atom is also made for airplane travel and will accommodate a dog up to 8 pounds or a cat up to 12 pounds. Available in six colors. The Mobile (see below) is like a small round pet bed with a mesh dome top with a carrying handle, kind of like a doggie hat box. The Mini will fit pets up to 7 pounds, the Medium up to 15 pounds. These are hard-plastic kennels (see below), with double-thick walls that go through the same manufacturing process as Olympic kayaks and are designed to withstand 4,000 pounds of force. 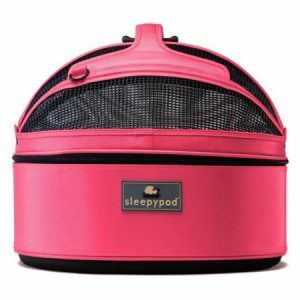 The Small will accommodate a pet up to about 30 pounds, the Intermediate up to 75 pounds. They both come with strength-rated tie-down straps. 40 Gifts for Cat Lovers, Perfect for Christmas Holidays!